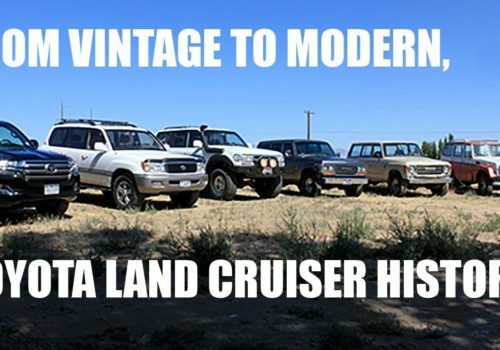 Toyota’s legendary Land Cruiser is brimming with heritage and comes with exceptional off-road capability. With seating for up to eight, a standard four-wheel-drive system, and a towing capacity of up to 8,100 pounds, the Land Cruiser is the rig that will be able to haul any mix of people and cargo, and tackle any road in front of you. Originally a military vehicle that was Japan’s answer to the Willys MB, the Toyota Land Cruiser was used on a number of campaigns during the Cold War with its first tour of duty being the Korean War. The Land Cruiser name, however, didn’t appear until the mid-1950s when Toyota was forced to stop using the “Jeep” name due to a trademark placed on it by Willys. The mid-1950s was also the first time that civilian variants of the Land Cruiser were introduced in a number of body styles including a pickup, two- or four-door SUV (called hardtop and wagon respectively), and a van. In the 1960s, Toyota separated the Land Cruiser into two variants, one for military duty and another for civilian use. A straight-six engine powered the four-door Land Cruisers from the late 1960s to the 1990s. From 1980 to 2008, Toyota manufactured the J60 and J80 Land Cruisers in Venezuela for the South American market. The J60, which was in production from 1980 to 1989, was the one of the first Land Cruiser models to add some luxury with rear seat heaters and an interior with better build quality. A larger 4.5-liter I-6 was introduced in the J80 Land Cruiser and its sister car, the Lexus LX 450. Toyota also added an electronic locking differential for U.S.-spec cars for the 1993 model year. The J100 series Land Cruiser and the Lexus LX 470 replaced the J80 and LX 450 respectively for the 1998 model year. This was the first time that the SUV was powered exclusively by a 4.7-liter V-8 in the North American market. Unique features that first appeared on the J100 Land Cruiser include an electronically modulated suspension with active height control and night vision. Production of the J100 Land Cruiser ended in 2007 when it was replaced by the current J200 Land Cruiser for the 2008 model year. In North America, the J200 Land Cruiser, and its sister car, the Lexus LX 570 are powered exclusively by a V-8 engine. A new 5.7-liter unit served as the base engine for both cars with 381 hp and 401 lb-ft of torque in the Land Cruiser. From the 2008 to 2015 model years, the Land Cruiser was available exclusively with a six-speed automatic transmission; however, an eight-speed unit replaced that from the 2016 model year and onward. Features such as CRAWL Control and a locking center limited-slip differential help improve the Land Cruiser’s off-road performance. This generation of the Land Cruiser is the most luxurious yet, featuring four-zone climate control, heated and ventilated front seats, a center console cool box, LED headlights, semi-aniline leather upholstery, and a wireless phone charging pad. Toyota refreshed the Land Cruiser for the 2016 model year and gave it an updated version of its Entune infotainment system with a large 9-inch touchscreen, a 14-speaker JBL audio system, the Entune App Suite, and a 4.2-inch display in between the gauges. For the 2017 model year, Toyota has added the Toyota Safety Sense-P suite of active safety features as standard on the Land Cruiser. The Land Cruiser also won a comparison test against the Jeep Wrangler and Mercedes-Benz G550 because of its excellent performance on- and off-road. Like its key competitors, the Jeep Wrangler, Land Rover Range Rover, and the Mercedes-Benz G-Class, the Toyota Land Cruiser has a storied heritage and its reputation for durability, reliability, and off-road capability makes it an icon in the auto industry. With a state of Art Manufacturing facility Harrow Security Vehicles uses only the finest craftsmanship and dedicated resources for each vehicle conversion. Our team consists exclusively of master craftsmen from all areas of vehicle construction. Harrow Security Vehicles uses only the highest quality of Armor and Ballistic materials available today for the manufacture of Armored SUV’s, using the state of art laser manufacturing equipment, and CAD-CAM engineered systems. Any client whom would like to visit our facility and view our vehicles and assembly process are welcome and it is worth spending the time as the facility and skill sets are unique and set us apart from other Armouring Companies.